Think of them as the 98-pound weaklings on the beach of the immune system – not terribly powerful on their own, but rev up tumour-infiltrating lymphocytes (TILs) with other immune cells, and no one’s going to kick sand in their faces! That’s the theory, anyhow. But now, a BioCanRx-funded research project is trying to show it can work and, in the process, provide new hope for women suffering from ovarian cancer, the most lethal gynecological cancer. The science is groundbreaking. It is known as adoptive cell therapy and involves extracting immune-system cells from a cancer patient’s tumour, growing them in the laboratory and then transferring those souped-up cells back into the patient in the hope they will kill cancer cells. TILs, the cells being used in this project, are a kind of T cell, or white blood cell that seeks out and destroys invaders in the body. When T cells are found within a tumour, they are called TILs. There has been research focused on using TILs in cancer research before. But this research, led by a team at Toronto’s Princess Margaret Cancer Centre (a partner in this project and a part of the University Health Network), has developed a novel method to increase the activity of TILs in the laboratory. Dr. Pamela Ohashi is the lead scientific investigator for the project, which is attempting to apply adoptive cell therapy to ovarian cancer. She is also the first researcher to bring TIL therapy to Canada, after training in the United States. She is excited by the way that adding dendritic cells (another type of immune system cell) to TILs in the laboratory can “supercharge” them to fight cancer. 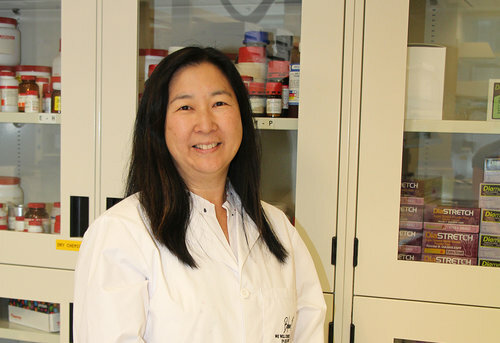 “We’ve been looking for how to activate tumour-fighting cells for decades,” says Dr. Ohashi. Its application is just as groundbreaking. It’s the first clinical trial in the world to use adoptive cell therapy for ovarian cancer and the first trial applying Dr. Ohashi’s Canadian innovation (the use of dendritic cells to activate TILs) to ovarian cancer. The trial is also training investigators from across Canada about what is required to perform TIL therapy at their own hospitals. The trial takes TILs from a woman’s tumour, stimulates them with dendritic cells, also from the woman’s body, and transfers them back. A drug called OKT3 is also used to activate the TILs. The process is being tested in women who are resistant to platinum-based chemotherapy and, if successful, could be used as a second-line treatment that provides better responses for women and gives them longer periods of remission. Currently women become resistant to chemotherapy after one or two bouts of the disease and have few other options. “If we are able to prevent complications from developing from their cancer and allow people to live longer, I think it will be quite significant,” says Dr. Marcus Butler, the lead clinical investigator overseeing the trial. If successful, it will serve as a basis for further clinical development of this “made in Canada” approach to TIL therapy, leading to new therapies for a cancer that has traditionally been very difficult to treat. The phase 1 trial, which is intended to focus on the safety and feasibility of the procedure, will eventually enrol 12 women. So far, five have been enrolled and treatment has begun on one. Ovarian cancer is the fifth-most lethal cancer in women, in part because its symptoms are so general that it’s often not diagnosed until the cancer has progressed significantly. There have been no treatment advances beyond chemotherapy and radiation in decades. Ovarian Cancer Canada is a knowledge transfer partner with BioCanRx, helping to convey information about research projects and their outcomes to the community. For more information about the trial, please see BioCanRx’s project summary or consult the trial page registered with ClinicalTrials.gov. BioCanRx works in partnership with industry, charities and other agencies to translate immune-based technologies from the lab into early phase clinical trials, and addresses socio-economic considerations necessary for their adoption by health-care systems. The network is developing and attracting the talent needed for a thriving health biotechnology sector in Canada.